Trade unionist fighting the victimisation and dismissal of RMT union activist Petrit Mihaj will be taking the fight against global union-busters Sodexo to the front door of the company’s London headquarters at 11am this coming Friday, the 14th November. Afterwards they will join up with the Orgreave Truth and Justice Campaign who will be taking their case to the Independent Police Complaints Commission, also at High Holborn, at noon on Friday afternoon. The campaign is marking two years of the “scoping” exercise into the violent policing at Orgreave during the Miners’ Strike in 1984 as well as repeating their demand for a full public inquiry. Petrit Mihaj has been a major force in building union organisation on the LUL Sodexo depot catering contract and has been instrumental in securing union recognition and delivering improvements in pay and conditions and effective representation of staff. An Employment Tribunal has already ruled that Petrit’s dismissal was 100% unfair and that he was sacked for his trade union activities but under the UK’s notorious anti-union laws the company are under no obligation to reinstate him to his original job. “RMT has always stood shoulder to shoulder with the miners and we will be proud to have our banners on the protest over the slow progress with the IPCC investigation into the policing at Orgreave during the strike in 1984. The fight for truth and justice will never be allowed to fade away and nor will the campaign to repeal the anti-union laws brought in after the Miners’ Strike. 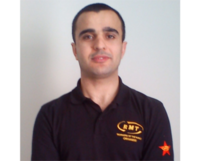 “The union-busters and their supporters have certainly never gone away and are alive and kicking in anti-union firms like Sodexho and in the outrageous treatment of RMT rep Petrit Mihaj.